When I was in college I used to go to this coffee shop that served a chocolate covered cherry mocha that I loved deeply. That was, ahem, a few years ago, and many miles away, and I’ve never found another coffee shop that can duplicate this dreamy drink. Inspired by the brew I once loved and lost, I created my new favorite hot chocolate: Chocolate Covered Cherry Hot Cocoa. No, my recipe isn’t for coffee, but dare I say it’s even better? I bet you’ll never guess the secret ingredient. This heavenly recipe starts out in the best possible way – easy. Prepare 12 oz. of piping hot cocoa using your favorite powder mix. Next, add the secret ingredient. Are you ready for this? Pour 3 T. of maraschino cherry juice into your cocoa. Doesn’t every kid fantasize about eating the whole jar of cherries? Well, this is basically like that. For the kiddos, just serve up this chocolate covered cherry goodness with marshmallows, or stir in a spoonful of marshmallow fluff. For the 21+ and over crowd, pour in 2 (or more!) oz. of marshmallow flavored liqueur. OH YES, I DID. 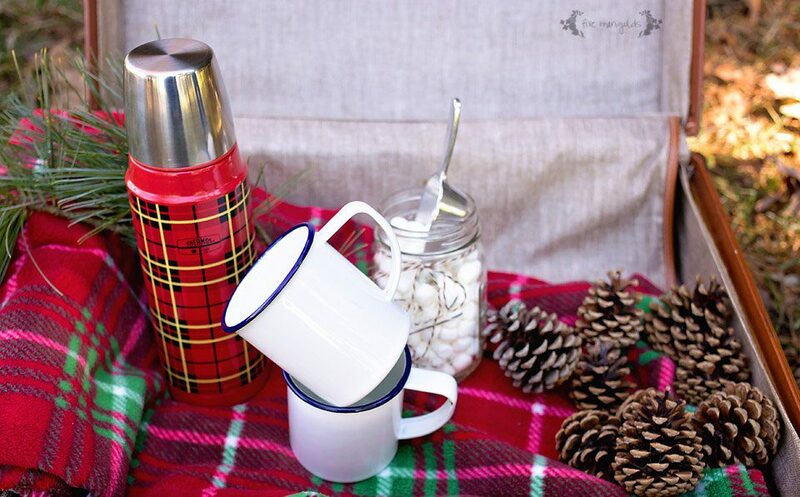 I love the idea of having a winter weather picnic in the park, or your own backyard. 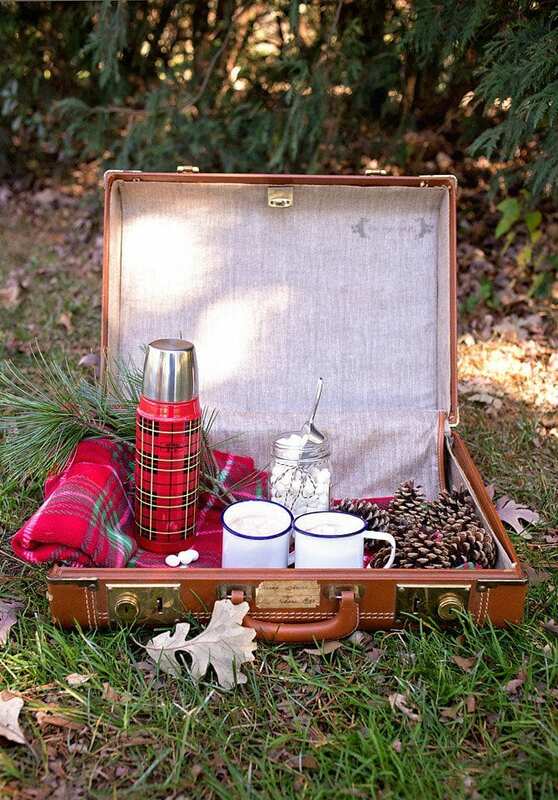 I placed all of my ingredients into a suitcase, instead of a traditional picnic basket. 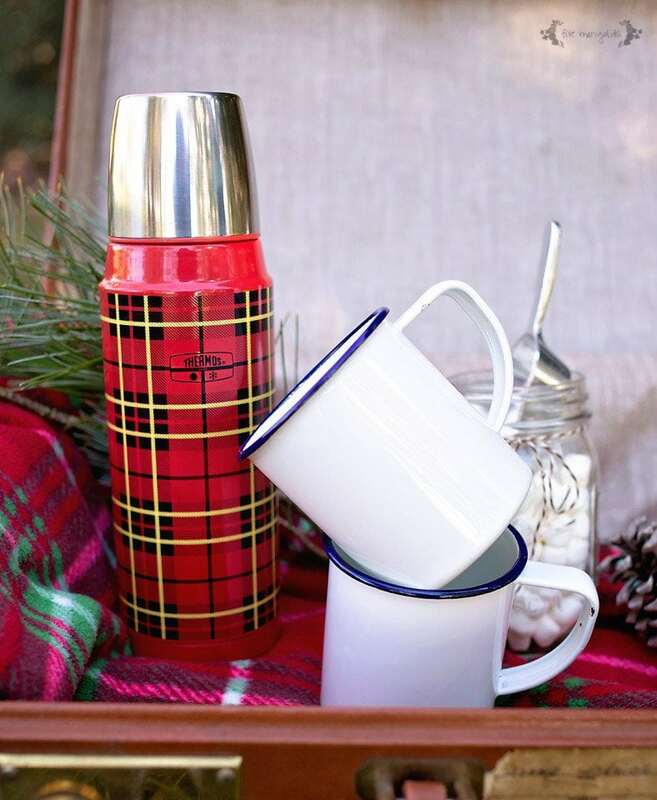 And how perfect is this vintage-inspired plaid Thermos® bottle for the occasion? I’m a sucker for the print! Even better – the vacuum insulation technology keeps hot drinks hot (and cold drinks cold). True story: I poured it full of piping hot chocolate around noon for our picnic, but forgot about the leftover brew until dinnertime. It was still the perfect temperature! 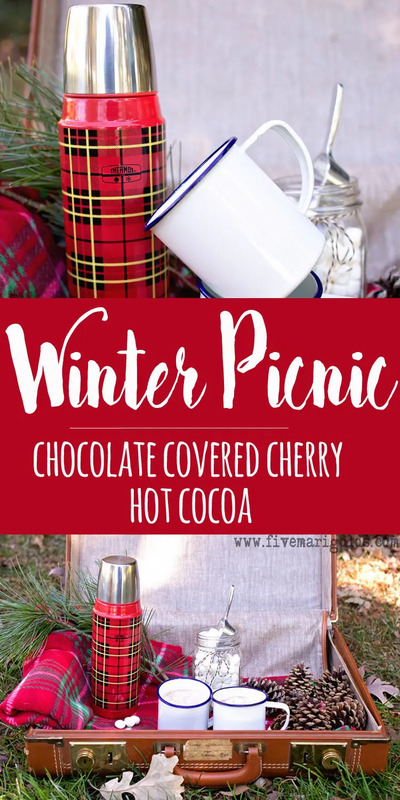 What do you think of my Chocolate Covered Cherry Hot Cocoa recipe? Or, are you a hot chocolate traditionalist? Let me know in the comments below! Prepare 12 oz. 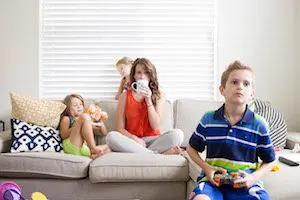 of hot cocoa using your favorite recipe or mix. Add 3 T. maraschino cherry juice. Optional, add 2 oz. marshmallow liqueur. I’m so glad this appeals to you as much as it does me. SO good! This sounds so amazing! I need to try this! 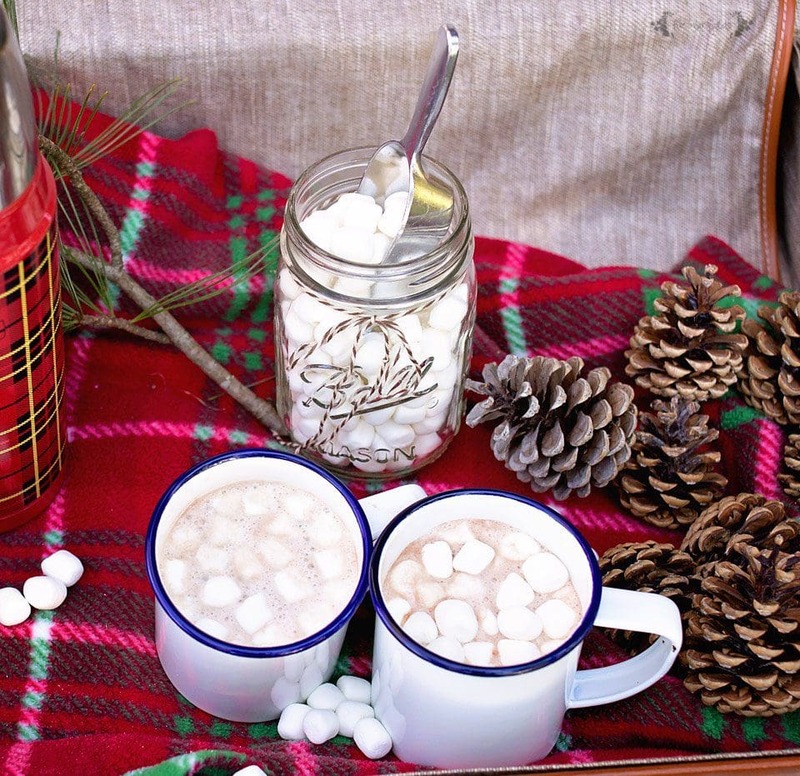 I love hot chocolate so much and love this variation on a classic. Can’t wait to try it.